Clean Greens is a blend of super-rich green foods containing grass juice, leaf, vegetables, seed sprouts, sea greens, freshwater plants and digestive herbs. Made with some of nature's finest herbs, grown in fertile organic soils it captures the incredible essence of nature's bounty. 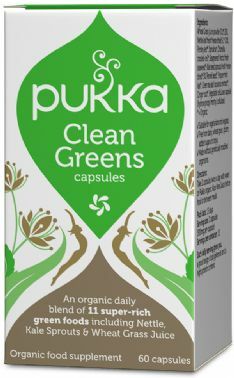 Clean Greens naturally support the body's ability to cope better with our polluted environment and supplement our diet. This broad-spectrum formula contains the highest organic grade, sustainably cultivated fruits and herbs, carefully selected to bring you the full potential of nature’s goodness. Wheat Grass juice powder 30:1 25%, Nettle leaf fresh freeze dried 9:1 20%, Parsley leaf, Spirulina, Chlorella cracked-cell, Seagreens® Arctic fresh seaweed, Kale seed sprouts fresh freeze dried 5%, Fennel seed, Peppermint leaf, Green tea leaf aqueous extract, Ginger root. Suitable for vegetarians and vegans. Storage Conditions Store away from direct sunlight below 30oC.